Please consider getting outside your paradigm as to what Unitarian Universalism is, as expressed within your home congregation. The very dynamic nature of Unitarian Universalism requires us to hold our faith lightly, not tightly, and be open to its diversity and ever-progression. 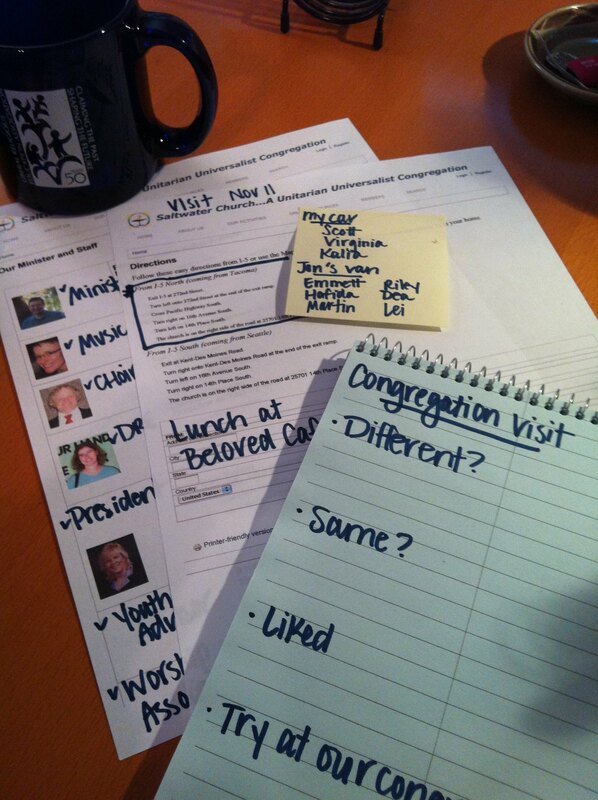 Even before you print out directions for your road trip, contact the comparable leaders from the congregation you are visiting. If you’re the president and are taking a worship associate and religious educator and the newly appointed canvass coordinator, then call ahead and arrange to meet with their president, canvass chair, some worship associates and religious educators. Ask for a tour of their facilities. Ask to see their guiding documents. What do love they about their role? What do they struggle with? Offer to take them to lunch and continue the conversation. Start paying attention the moment you look up the website to the destination congregation in order to glean directions and contact information for leaders. Take in the whole experience of driving up to the building and then being greeted. Pay attention to the response of all your senses in worship and fellowship. 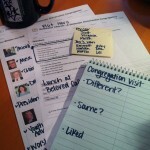 How is it different than your home congregation? How is it the same? How does this inform your understanding of Unitarian Universalism? What might you like to try in your own congregation? For those of you crying out, “But we don’t have another Unitarian Universalist congregation within reasonable driving distance!” please reach out to any liberal religious community within reasonable driving distance! Sometimes we can learn more from other faith traditions more than our own. Another option is to experience other congregations through the following video series. You can process the same questions while watching the videos as would on your in-person experience. And you can contact the leadership from those congregations to set up a phone or video conversation to tap into their wisdom and experience. Breakthrough Congregations – These short videos highlight congregations that have achieved significant and sustained numerical growth by breaking through an obstacle in the areas of spiritual vitality, organizational maturity, faith in action, and/or associational growth. A Religion For Our Time series: These short videos highlight inspiring work in congregations, including innovative projects relating to worship, religious education, social justice, membership, and fellowship. May this be the beginning of a supportive and collaborative relationship! Bridgehampton NY congregation has made plans to take the ferry over to visit All Souls New London after reading All Souls’ Breakthrough Congregational article in the UU World. The visit is scheduled for December 9. Bridgehampton folks will attend worship, meet with All Souls leadership, then share a meal afterwards. Yes!